The i-NX is offered in both standard and low noise options, whilst the smaller i-BX air-cooled chiller range is available in both single and three phase variants. This makes both ranges ideal for a wide variety of comfort and process cooling applications. 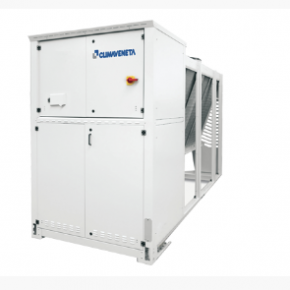 The new models improve on Climaveneta’s traditional chiller design by employing inverter driven compressors, which guarantees maximum efficiency at partial loads. Very few chillers are likely to operate at maximum capacity for more than a few hours a year, so efficiency at partial loads is a major factor in overall efficiency levels. The i-BX range offers capacities from 4kW to 35kW to deliver flexible and reliable units that adapt to the most diverse load conditions, whilst offering accurate temperature control and high levels of energy efficiency, both at full and partial loads. All of the hydraulic components for installation are also already included within the outdoor unit reducing added cost. For larger applications, the new i-NX delivers capacities from 43kW to 129kW to offer exceptionally high levels of energy efficiency, whether at partial or full load. These models incorporate a fixed speed scroll compressor and a scroll inverter compressor, working together in the same circuit, to offer far greater levels of efficiency than traditional fixed speed compressors systems. As part of Mitsubishi Electric’s commitment to efficiency, both the i-NX and i-BX range are ERP compliant up to 2021, helping businesses to not only reduce their emissions but also energy consumption. The new ranges come complete with a range of customisable options, including coil coatings, built-in pumps, heat recovery modules and BEMS connectivity.